As your core client base continues to age and draw down assets, you're probably already thinking of ways to generate new revenue. Some advisors are hoping to attract Gen X clients—the children and grandchildren of their top clients, who stand to inherit significant wealth. But here are some eye-opening statistics: according to the Investment Management Consultants Association, only 2 percent of children keep inheritances with their parent's financial advisor—and only 5 percent of all inheritors keep assets with the same advisor, regardless of whether a parent has died. It's clear there's work to be done! So, what are the best ways to attract Gen X clients to your practice? 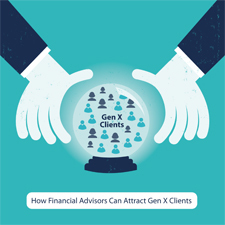 By better understanding Gen X prospects, you can build an effective marketing plan that leads to loyal client-advisor relationships. 1) Gen X might distrust the financial industry. The events of their generation—Watergate, the energy crisis, and the 2008 financial crisis—have caused some distrust of the financial industry. To build trust, be forthcoming—about commissions, fees, and all aspects of your business—when marketing to and working with Gen X clients. Also, focus on educating and explaining your investment decisions. If they understand your strategy and trust your judgment, they're more likely to keep their money with your firm for the long term. 2) Gen X does their homework. Gen X includes many highly savvy Internet users. They'll likely investigate you and your competitors online before choosing an advisor, so be sure to build a reputable online presence. 3) Gen X generally engages with social media (if it's done well). Gen X tends to enjoy connecting with businesses and professionals who consistently share interesting, unique content. 4) Gen X has limited time. When marketing, emphasize your ability to communicate via multiple outlets (e.g., e-mail, videoconferencing). They'll appreciate the convenience of being able to connect with you on a variety of platforms. You might consider a software package (e.g., Skype) that allows you to make calls over the Internet, transfer files, and videoconference (some functions may be prohibited by your firm's compliance policies). 5) Gen X generally values personal connections and individuality. In the information age, many Gen Xers prefer doing business with people and organizations that they respect and connect with personally. When marketing to Gen X clients, share personal stories and demonstrate your desire to build a strong relationship. Simply sending a personal note to Gen X clients/beneficiaries when they buy a car, marry, or experience any major life event can demonstrate your commitment to their success. As your client base expands from baby boomers to Gen X clients, your marketing strategy will also need some adjustments. Leverage current client relationships. Working with clients' children, grandchildren, or beneficiaries can be a successful strategy to attract Gen X clients. It's important to get your clients' permission before contacting their children and grandchildren. Tell them when you plan to reach out and what you'll speak about. Collect contact information and record it carefully. Ask your clients for their children's or grandchildren's names, dates of birth, and contact information. Consider using a CRM system to record information and send reminders to call and e-mail periodically. Prepare clients for the "money talk." Encourage clients to talk with their children, grandchildren, and beneficiaries about finances. This will help prepare younger investors for their financial future—and help keep their money within your firm. Despite what many believe, no one has a bigger influence over a child than his or her parents! Host beneficiary meetings. One-on-one meetings with clients and beneficiaries can start the estate planning conversation. It's also an opportunity to open communication lines with beneficiaries and start your relationship on the right foot. Rely on junior advisors. Consider having junior advisors reach out to younger generations. They can send handwritten notes or offer free financial overviews to prospects, for example. Maintain a vibrant, unique online presence. Gen X tends to want to work with experts and individualistic professionals. Be sure to consistently share your knowledge through your website and social media platforms. Create informational pieces, blog posts, and videos to share via e-mail, on your website, and in online publications. They can educate your target market and promote you as a trustworthy expert. Keep your content varied and fresh. Gen X often spends more time on sites that offer a variety of content (e.g., articles, videos, webinars, infographics). Keep your company website updated and modern. If a Gen X prospect thinks your website is old and outdated, he or she might assume the same is true for your practice. Focus on search engine optimization (SEO) so your website will be found. Update your business's Facebook and Twitter pages frequently. Post about events, link to relevant articles, and ask engaging questions. Use LinkedIn to focus on topics relevant to your audience's professional and financial needs, and join groups that include your target audience. LinkedIn's primary purpose is networking, so don't hesitate to ask for introductions. Create a partnership. Gen X clients tend to want to know the details of their investment portfolio and be hands-on with the investment strategy and decisions. Treat your client-advisor relationship more like a partnership to help promote loyalty. Webinars. A webinar series on hot-button topics that apply to your Gen X clients' financial situations can help educate clients in a way that's convenient for them. Aptly themed events. Offer events that apply to Gen X clients' current financial concerns. For example, someone who is considering a new career may find an event about career change preparation extremely useful and appealing. Marriage, education planning, and divorce are other ideal topics. Informal events. A trivia night, a cooking class, or a sporting event, for example, can cultivate relationships. These events aren't intended for recruiting, so don't promote yourself. Instead, focus on demonstrating you care about them on a personal level. Host a focus or advisory group. A focus group can help elicit feedback, promote your commitment to the community, and (hopefully) generate referrals. Invite local Gen X clients, prospects, influential people, and others. Host small groups—no more than 10 people—to encourage interactivity. You might ask for feedback on existing services, reactions to your office space/location, or suggestions for getting referrals. Once a few Gen X clients have signed on with you, ask why they chose your services and why they continue to work with you. Once you understand what persuaded them, don't be surprised if this strategy succeeds with other Gen Xers. Consider asking centers of influence (e.g., CPAs and attorneys) to participate in an advisory group about successfully reaching and working with Gen X clients. To attract Gen X clients and other younger investors, you might have to make some adjustments. With an informed, strategic marketing plan, however, you can quickly grow your client base with Gen Xers who may need your planning services for many years to come. Have you been able to attract younger investors to your practice? Are you skeptical of this growth opportunity? Please share your thoughts below.